The family of a man struck by an alleged DUI driver gathered at the scene of the accident to pray. A local family is mourning the loss of a man who police say was struck and killed by a DUI driver Friday night in Kensington. It happened around 6:15 along the 1900 block of Lehigh Avenue, according to police. Gregory Loper, 49, had just gotten out of work and hopped onto his bike to make a quick trip to the store. Suddenly police say Brett Truskin, 22, of Warminster, drove into the bike lane, striking Loper. Truskin also crashed into a 52-year-old pizza deliveryman's Red Suzuki and hit numerous other vehicles before coming to a halt. 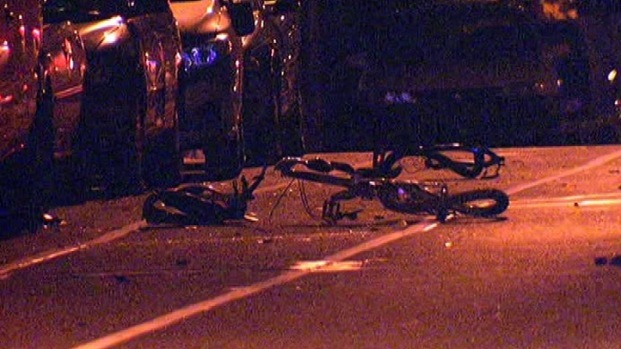 Police say a man driving under the influence killed a man riding a bike Friday night in Kensington. The alleged DUI driver also hit several other vehicles and crashed into the a pizza deliveryman's car, cops say. "(The cyclist) was hit in the street and he flew across my niece’s car," said neighbor Ginny Smith. "That's how hard he was hit. His shoes are in the street -- right out if his shoes." Loper suffered head injuries and was later pronounced dead at the hospital while the pizza deliveryman was listed in stable condition with stomach pain, police said. Truskin wasn’t hurt in the crash and was able to stumble for about two blocks until neighbors reportedly pinned him. Police then arrived and arrested him. Police say Truskin had been charged with a DUI last Wednesday but was released only a few hours before Friday's accident. He is charged with homicide by vehicle while driving under the influence, involuntary manslaughter, driving under the influence and other related charges. Loper's family gathered at the scene of the accident on Saturday to pray. "Right now I feel like I can't go on without him," said Loper's wife Bettie Cuffee. Cuffee says Loper, the father of 11 children, worked several jobs to take care of his large family. "If he had to shovel in front of your door to get us a loaf of bread he did it," said Cuffee. "If you needed help with anything he did it."